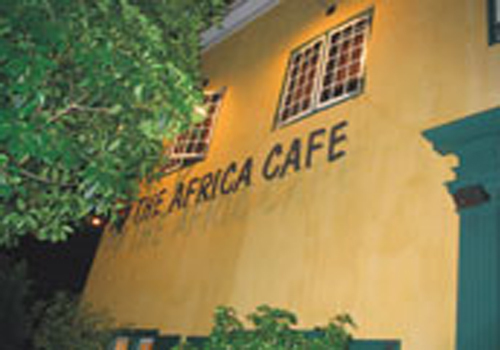 The Africa Café is situated in a beautifully restored 18th Century Cape Georgian Home at No 108 Shortmarket Street, Capetown.The serving is known as a Communal Feast and is indeed a feast of dishes from all over Africa and it highlights a new part of Africa every two or three months. 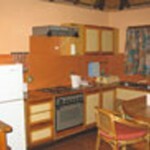 Chef Portia serves a wide variety of cuisine from finger foods hawked at a road side stall in Malawi or a steaming plate served under a Thatched Khaya. 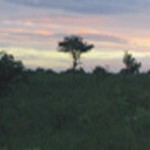 All African meals are shared – there are no starters or main courses. The meal can be shared by all at the table and you can eat as much as you want and that includes tea, coffee and desserts as well. The following morning which was day nine of our FUNDI trip, we would take a boat to visit Robben Island – the Alcatraz of South Africa. Robben Island is around 12 kilometres from Cape Town and has been a place of banishment, exile and imprisonment for almost 400 years. It was here that rulers sent those they regarded as political troublemakers, social outcasts and the unwanted of society. 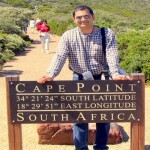 During the apartheid years Robben Island became internationally known for its brutality. The duty of those who ran the Island and its prison was to isolate opponents of apartheid and to crush their morale. Some freedom fighters spent more than a quarter of a century in prison for their convictions. Those imprisoned on the Island succeeded on a psychological and political level in turning a prison ‘hell’ into a symbol of freedom and personal liberation. Robben Island came to symbolize, not only for South Africa and the African continent, but also for the entire world, the triumph of the human spirit over enormous hardship and adversity. It was home for many years to famous South Africans – the most famous of them all undoubtedly being Nelson Mandela – the Former President of the post apartheidperiod. The cream of the country’s political leadership spent time here plotting about how they could win freedom and independence for their people. The Nelson Mandela Gateway is the departure point for Robben Island tours and was opened late in 2001 and has a museum which depicts the struggle to overthrow apartheid. We were lucky to witness original lithographs of Nelson Mandela which was on display at the gateway before boarding our boat which would take us to Robben Island. In the 1840s, Robben Island was chosen for a hospital because it was both secure (isolating dangerous cases) and healthy (providing a good environment for cure). During this time, political and common-law prisoners were still kept on the Island. As there was no cure and little effective treatment available for leprosy, mental illness and other chronic illnesses in the 1800s, Robben Island was a kind of prison for the hospital patients too. Since 1997 it has been a museum. The museum is a dynamic institution, which acts as a focal point of South African heritage. It runs educational programmes for schools, youths and adults, facilitates tourism development, conducts ongoing research related to the Island and fulfils an archiving function. The guided tour was led by an individual who had spent a major part of his life in the prison. Hence, the narration was full of emotions and it depicted the atrocities that some of the freedom fighters had to face during the apartheid days. Nelson Mandela spent as many as 27 years here, and his prison cell is the highlight of the trip where in such a small chamber he spent several years of his life. Robben Island, where he was imprisoned, became a centre for learning, and Mandela was a central figure in the organised political education classes. We halted for lunch at ‘De Goewerneur” which is home to the traditional cuisine of South Africa, located at the Castle of Good Hope. The Castle of Good Hope is the oldest colonial building in South Africa and was built by the Dutch East India Company way back in 1679. It was the regional headquarters of the South African Army in the Western Cape and houses the famous William Fehr Collection of historic artworks, the Castle Military Museum and ceremonial facilities for traditional Cape Regiments. The Castle of Good Hope was walking distance from our Hotel at the Strand. Later in the afternoon we visited Signal Hill. 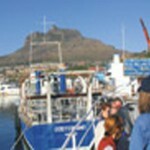 Signal hill separates the suburbs of Green Point from the City Bowl and one can access this extension of Lion’s Head Mountain from the city via KloofnekRoad.Late in the day we had ample time to visit Canal Walk – one of Africa’s most exciting shopping and leisure destinations and part of the Century City. To find out more about Canal Walk and the visit to the southernmost tip of the African continent you would have to wait until the next issue of Opportunities Today.